It is possible to state that the system is an organized aggregate of multiple and single bets. 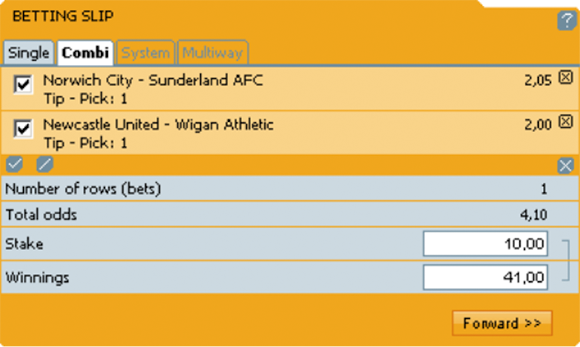 It is used for abbreviated recording of logically related bets, the same amount being wagered on each bet. All bets of a certain system refer to the same range of selected outcomes. But each bet can include a different number of those outcomes. The total sum for playing the system is defined by multiplying the selected sum (same for each bet) by the number of the bets. The winnings from a system is equal to the sum of the winnings to be paid for each winning bet. In contrast to the multiple bet, with the system you do not need to guess all your selected outcomes to achieve a profit. Let us see one example of how the 2 out of 3 system works. In this case, the bookmaker is showing the average odds of all bets taking part in the system as “Total odds” , while “Winnings” is the sum to be paid if all odds are winning. In case you guess all 3 selected outcomes then all your 3 bets will be winning. This is equal as a sum to: 37.92 + 37.00 + 41.00 = $115.92. After you subtract the wagered amount of $30, you see that your net profit from the system is $85.92. When you record the 3 bets as a system, the bookmaker shows you that the total amount paid out (Winnings) will be $115.93 in case of success of all 3 bets. There is a difference of 1 cent of the summed profit upon divided recording of the bets. This is due to the rounding performed during arithmetic computations. Thus supplemented the system with 4 bets is already called Trixie and it can be found with bookmakers under that name. Trixie, in its turn, can also be modified. 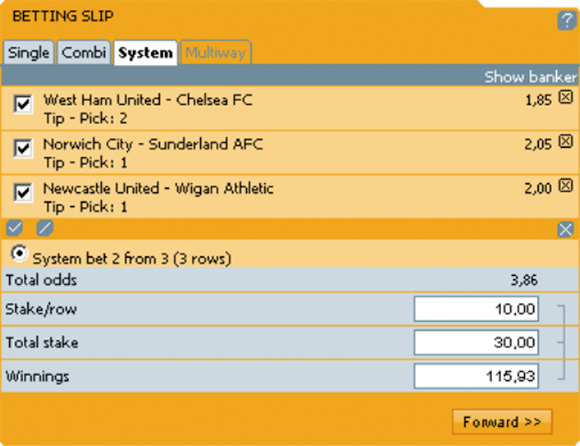 In order to be totally secured, you could add to it 3 more single bets – one for each of the 3 selections chosen by you. As a result a system of a total of 7 bets is obtained, called Patent. 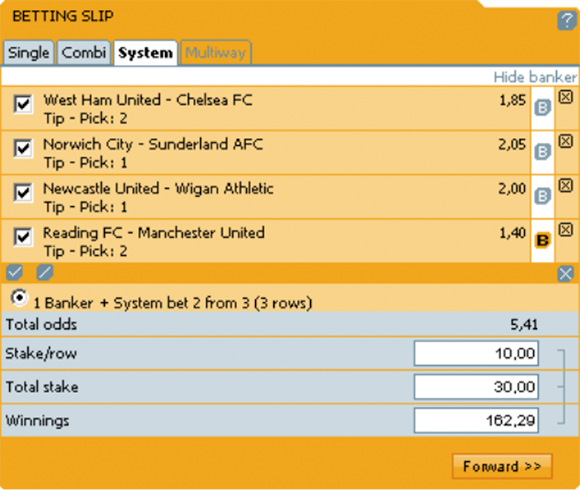 It is applied when you have chosen 4 selections; it contains a total of 6 bets. Each bet contains 2 selections. In order to be paid a certain amount, you have to guess at least 2 of the 4 selections. Also 4 selections, but it contains a total of 4 bets, each one containing 3 selections. You achieve payment in case of at least 3 successful outcomes. It contains a total of 11 bets on 4 selections. This system includes the above-mentioned 2 systems (2 out of 4 and 3 out of 4), and one more bet is additionally placed, containing all 4 chosen selections. A return of an amount is achieved in case of a minimum of 2 selections guessed. When 4 single bets are added (1 to each selection), a system of 15 bets is obtained, which is called Lucky 15. 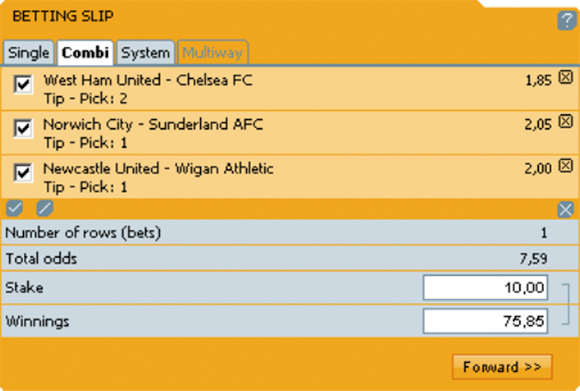 It contains 10 bets; you need to have a minimum of 2 successful selections to be paid an amount. It contains 10 bets; you need a minimum of 3 successful selections. It contains 5 bets; you need to have 4 successful selections. 1 bet, which contains all 5 selections. A minimum of 3 selections guessed are needed for paying out an amount. This system contains a total of 26 bets. It is obtained by adding to the previously described system (345 out of 5) 10 more bets-each one with 2 selections. A minimum of 2 need to be guessed in order to get a minimum payment. By adding 5 single bets (1 to each selection), a system of 31 bets is obtained, which is called Lucky 31. 1 bet with all 6 selections. By adding 6 single bets (1 to each selection), a system of 63 bets is obtained, which is called Lucky 63. 1 bet with all 7 selections. 1 bet with all 8 selections. The banker is a selection which you suppose is significantly more likely to guess, compared to the other selections of yours. When a banker is added to your system, the said banker participates in all bets of the system. Thus your potential profit is increased (multiplied) by the banker’s odds. Some bookmakers allow you to add one or several bankers to the selected system. But, you need to approach the selection of the bankers extremely carefully because if you lose a banker-selection, then your whole system will lose. Let us return to the specific example with the matches from the England Premier League and place in our system one more selection which is to be a banker. As you can see, Manchester United is an outstanding favorite in its guest match with Reading. The high probability that they win the match is recognized by the bookmaker as well and that is why the odds offered is only 1.40. As you will notice, the averaged odds of the bets in the system (Total odds) has increased to 5.41, which is equal to the previous amount (without a banker) 3.86 multiplied by 1.40 (the banker’s amount). Winnings has also increased with a factor of 1.40 and from $115.93 it has become $162.29.